Imagine being apart of a genealogy that is remembered for their faithfulness to their God, to their family, and to their work? This is what we see here in this passage. A people group, whose lives were centered around a Holy God. Everything flowed from the God they worshiped, loved and served. The question now becomes: Can the same be said about you and I? Do the work of God with all of your heart. Labor with all of your might and you will prosper in the Lord. Set aside each day, time and moments to rest in holiness… In God’s Holiness. As we spend time with our Holy God, He goes out of His way to make us look more like Him, think like Him, act like Him and talk like Him. God wants His people to be a Holy people. That is His desire for you and I.
Holiness requires a great sacrifice of time and energy. Our holiness requires resting in God. In return, God expects us to exert a lot of time and energy towards Him. 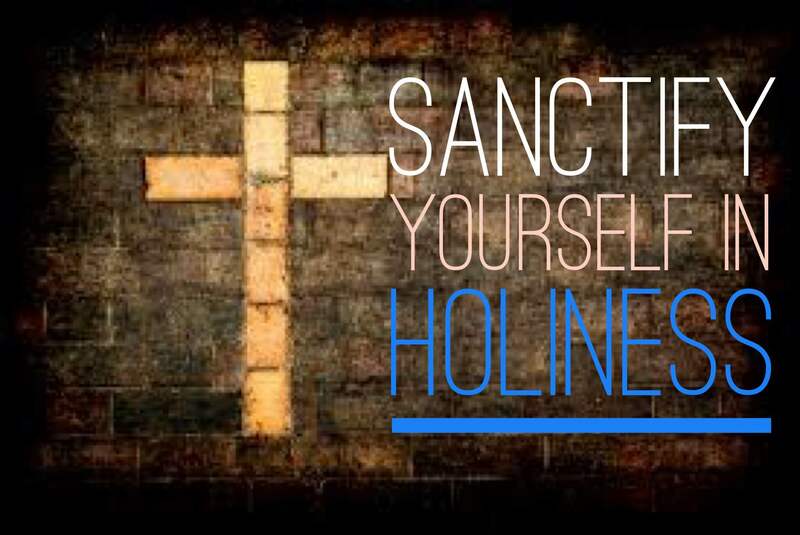 We as Christ followers are to sanctify ourselves in Holiness. In other words, through the power of our Holy God we serve, we are to be set apart and focused on God daily. Our lives should be a reflection of the Bible we read and the God we serve. Our language, actions and thoughts should reflect Holiness. Our holiness should not be questioned for bad but it should be commended for the great God Who is in our lives. We should be grateful and thankful for the God who sets us apart and calls us to Holiness. We as Christ followers no longer have to follow the sinful patterns of this world. We can be apart of this world and no longer be slaves to the lustful entices, as well as devices the world throws at us. We now get the wonderful privilege and opportunity to follow the patterns of Christ, which is, liberty, freedom, social justice and love. How beautiful is that? Our lives and our rhythms should stem out of our relationship with the Father. Think about the life Christ lived. Everything flowed from the time He spent with His Abba Father! May we live according to the Gospel that has been imparted to us. May we love according to the love that God has shown us through His Son Jesus. May others take notice and follow in our footsteps. May others get inspired to desire after the Holy God we follow and serve. May they want the God that is in us. May they notice the sanctity of our holiness. P.S. Here is a question for you to ponder on. Is living Holy something I am capable and willing of doing? Next post#TGIF – Thank. God. I’m. Forgiven. Great post, bro! Not too many ministers speak on holiness for the fear of losing followers! I desire to be holy because I want to see HIS face one day….there is no other way! Be ye Holy for I, Your Lord God is Holy. That plays in my mind often. Holiness is not an option but a requirement. That’s what God desires of us. Thanks for reading and responding. God bless sis! “Holiness, Holiness, is what I long for, Holiness is what I need!” Thank you for this awesome reminder. Striving for Holiness is what we all should be after! Babra, all those who are in Christ are called to live a of Holiness. We are Holy because He is Holy. He (Christ) is living His life through us. We are united to Him. May we allow Him the fullness of our lives!